Improving Lives, One Black Belt at a Time! FOCUS – Just imagine, what would life be like with more focus? If you could do something to help yourself or your kids become more focused, how would that improve your everyday life? Our martial arts classes here in Fairport have a proven track record of improving focus and concentration in our students. We’ve had parents of our younger students and our adult students alike who can’t get over what a difference our classes make! Along with better focus and concentration, students also notice increased energy, coordination, courtesy, and confidence in themselves! At Kime Karate we put training first. We have worked hard to create an environment that is conducive to the best possible martial arts and fitness training. Students learn traditional martial arts in a progressive, systematized self defense practice. We teach a system that is self defense based. A self defense system that is practical and functional that will actually help you deal with real altercations, not develop false confidence. While most schools teach a system that is sport based, our system is based on functional self defense because it is better to have the skills and never need them rather then need the skills and not have them. This is one of the many reasons why we are invited into the local school districts to teach self defense and anti-bully skills. Our school does it right, with our age appropriate training and strong anti-bully message. You don’t have to be aggressive to defend yourself, no bullying necessary. We are a family operated martial arts school in Fairport, NY. Because our school is run by a local family, Aric & Pamela Keyes. We are a great option for other families looking for a friendly, personal experience. Our family friendly training center is safe for kids of all ages. We have a family waiting room with free wifi and separate kids play room for kids to play in while waiting for their class or their parents, siblings class. We are a Black Belt School! It is not only important that students learn how to defend themselves it is important that students improve their health and become better individuals, become leaders in the community and can improve those around them. Students are encouraged to work together to help each other succeed. After all, the ultimate aim of martial arts should be to improve the character of it’s participants. Classes are lead by school owner & head instructor, Sensei Aric Keyes. A black belt in multiple martial arts styles with over 25 years of international experience teaching martial arts professionally. Sensei Aric Keyes is our head instructor. With well over 30 years of martial arts experience and more than 20 years teaching professionally to military, law enforcement and civilian students. A 5th-degree Black Belt in traditional Karate as well as a Black Belt in Koryu Uchinadi under Hanshi Patrick McCarthy. Aric also has a Bio-Medical imaging degree from RIT along with a business management certification from the Saunders College of Business. An ARMY Veteran of 13 years where he was a combat medic and senior trainer in his reserve unit. Aric is an expert in safety & security, specializing in school security. He is certified by Cornell University as a Therapeutic Crisis Intervention (TCI) instructor as well as a certified instructor in Nonviolent Crisis Intervention by the Crisis Prevention Institute. Besides his technical proficiency and deep understanding of martial arts, he is known for his patience and calm demeanor when helping his students. 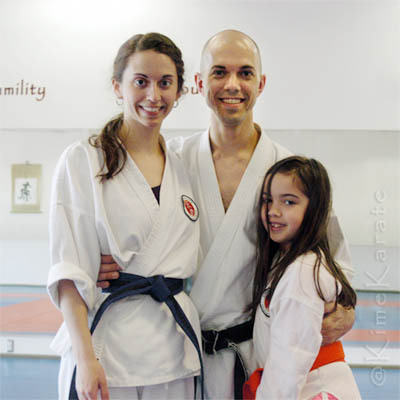 Working with students as young as 3 years old, Sensei Keyes is great with students of all ages and all skill levels. Sensei Keyes uses his knowledge and understanding of anatomy, physiology, biomechanics, physics as well as the psychological effects of stress and violence to thoroughly explain how we apply our traditional self-defense practices to modern altercations. With his incredibly diverse background of knowledge and experience with which to draw upon while teaching, you are guaranteed to learn something in every class! To provide the highest quality student-centered Martial Arts training in a positive, family-oriented environment. To enable our students to pursue a path to wellness of body, mind and spirit through the Martial Arts. To help our students better themselves through the Martial Arts, and in so doing, enable them to become agents of positive change in their families and in the community. Located just north of the Perinton Rec Center. Take the lower entrance into Turk Hill Park (1000 Turk Hill Road) for building #6 which is the building closest to the canal. Look for the double yellow doors for the class room entrance. We thrive on helping students succeed. Our staff is knowledgeable, friendly and here to help you. Our training facility in Fairport, NY is one of the best in the country and our training floor is the safest in the industry. Come see why Kime Karate is the place to train in the greater Rochester area. Request your FREE trial or call 223-2870 to get started! Sensei Keyes was the first to develop a formal self defense curriculum to teach school aged kids self defense within the United States and has been refining it every year since. He is the only instructor in the area to run a self defense program in local school districts as part of that school district’s curriculum. Where other martial arts instructors are turned away, he is invited into local school’s including the Fairport, Victor & Brighton school districts.